Police prepare evidence during a press conference, April 11, 2018, regarding the arrests of suspects linked to the production and sale of illegal bootleg alcohol, which claimed the lives of more than 80 people this week in Jakarta and nearby West Java province. The more than 100 deaths across Indonesia this month related to bootleg alcohol highlight Indonesia’s intractable problems with illegal and homemade liquor. There is a large black market for alcohol, which is highly taxed in the Muslim-majority nation, especially since 2015, when Indonesia banned the sale of alcohol at convenience stores and mini-marts. Thirty-one people recently died in Jakarta, as well as dozens of others in Java and Kalimantan islands. The West Java city of Bandung declared a state of emergency Tuesday. All this has led some investigators to suspect a specific bad batch, according to a report by the French News Agency AFP. But so far they have not pinned any single distributor. Police have, however, arrested at least seven individuals, one of whom admitted that his recipe for oplosan, a term for home-brewed alcohol cut with non-food ingredients that have not gone through the distillation process, included mosquito repellent, cough syrup, and pure alcohol. Government officials destroy bottles of illegal alcohol confiscated in Serpong, on the outskirts of Jakarta, Indonesia, April 13, 2018. The reported death toll from bootleg liquor increased from 149 deaths between 2008 and 2012 to 487 deaths between 2013 and 2016, according to further CIPS research. “With the ban [in place], the market niche for recorded alcohol previously covered by mini-marts and convenience stores has been taken over by numerous undocumented alcohol kiosks, which have secretly been purveying potentially more harmful, unregulated alcohol products, including illegal moonshine and oplosan,” said Sugianto Tandra, a CIPS researcher. 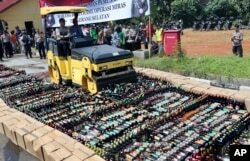 Police use a road roller to destroy bottles of illegal alcohol confiscated in Serpong, on the outskirts of Jakarta, Indonesia, April 13, 2018. 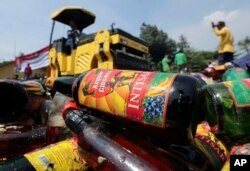 Deaths from drinking toxic bootleg alcohol in Indonesia have exceeded 100 this month. The Indonesian parliament has long debated a total prohibition bill that was spearheaded by Islamist parties, but it has stalled until now at the highest levels. Indonesia’s largest Muslim organization, Nahdlatul Ulama, came out against the ban last year after conducting independent research into oplosan sales. NU’s research unit found that more than 70 percent of surveyed teenagers could easily get cheap oplosan on the street, which the group considers a major public health hazard. “No one has ever died from drinking beer, but our young people could die if they drink bootleg liquor,” said NU researcher Abdul Wahid Hasyim. “As a Muslim, of course, alcohol is still haram (forbidden). But this is not about halal or haram, this is about saving our younger generation, this is about making an effective policy,” he said. Beyond keeping the prohibition threat at bay, Indonesia also must figure out how to actively combat oplosan and moonshine consumption.